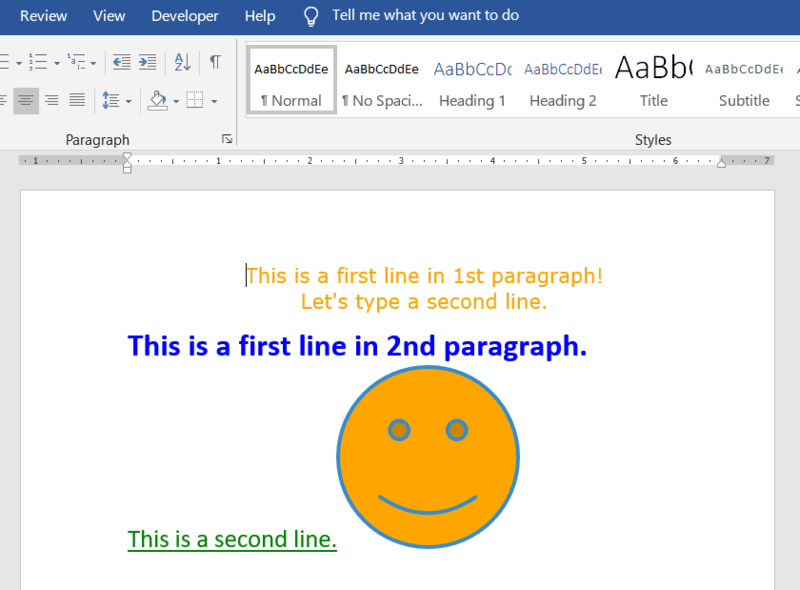 Create a new instance of Paragraph with two Run elements and add it into the section. // Way 1: Add 1st paragraph. // Let's create a characterformat for text in the 1st paragraph. // Let's add a line break into our paragraph. Paragraph is a Block derived element used to group Inline elements like a Run, Shape, Picture, Field etc. Let's add a second Paragraph with text using ContentRange. The ContentRange recognizes the line feed «\n» character as a signal to create a new Paragraph. // Way 2 (easy): Add 2nd paragraph using ContentRange. ContentRange represents an area in document as a contiguous sequence of characters boundend by start and end positions. It allows to insert and extract data in a streaming manner in(from) desired positions. Here we've explicitly specified RtfSaveOptions as the second parameter. You may find extra info how to Save a document in RTF format. /// Creates a new document and saves it into RTF format. // Set a path to our rtf file. // Let's create a simple Rtf document. // Let's set page size A4.
''' Creates a new document and saves it into RTF format.
' Set a path to our rtf file. Dim rtfPath As String = "Result.rtf"
' Let's create a simple Rtf document.
' Let's set page size A4.
' Way 1: Add 1st paragraph.
' Let's create a characterformat for text in the 1st paragraph.
' Let's add a line break into our paragraph. text2.Text = "Let's type a second line." ' Way 2 (easy): Add 2nd paragraph using ContentRange.